You’ve heard it before, “It’s not about what you sell. It’s about the value that your products or services provide.” But what does that mean? 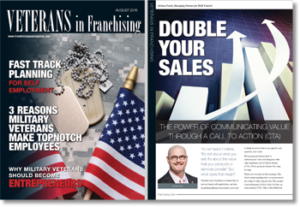 Whether your franchise is commodity or service based, sell sandwiches, cut hair, or perform disaster restoration, you want to think in terms of how you qualify and quantify your value. We’re going to discuss how to communicate value and integrate with what marketers call a Call to Action (CTA). We’re going to discuss this, step by step. There are two parts to this strategy. The first is understanding how to communicate the value of what you provide. The second is providing part of this value, for free, as your primary CTA. This is then followed with what we call a “trip-wire” for a second CTA. You never provide more than one CTA at a time. It’s not overly complicated. We’ll use an example so you can tailor it to your franchise. Like anything else in business, it will take some of your time but it’s well worth it.